Once you've inserted a character in your course, you can use the Character Tools to quickly and easily make adjustments without having to reinsert the character from scratch. This is especially helpful if you've applied animations, image effects, or other customizations to the character. You can easily swap to a different character, expression, pose, or perspective without losing your work. Select a character on a slide or slide master. 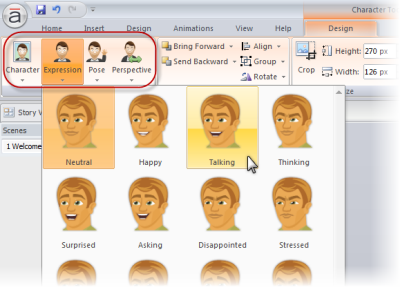 For illustrated characters, you can change to a different Character, Expression, Pose, or Perspective. 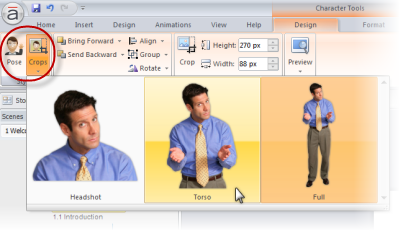 For photographic characters, you can change to a different Pose or Crop. Bring Forward: Click this option to bring the character forward one layer on your slide. Or, to send the character to the very front layer, click the small arrow next to Bring Forward and then choose Bring to Front. Send Backward: Click this option to send the character back one layer on your slide. Or, to send the character to the very back layer, click the small arrow next to Send Backward and then choose Send to Back. Align: Use this option to align characters with one another or with other objects, or to align characters with the slide itself. Click Align and choose either Align to Slide or Align to Selected Objects. (If you've selected just one object rather than multiple, only Align to Slide will be available.) Next, click Align again and choose one of the alignment options (left, center, right, top, middle, or bottom). Or, to space multiple items evenly, choose Distribute Horizontally or Distribute Vertically. Group: Grouping is a handy feature that allows you to move, resize, rotate, flip, or change other attributes of several objects all at the same time — as if they were a single object. To group objects, use Shift-Click to select two or more objects, and then choose Group to group them. If you later wish to ungroup them, you can select the group and choose Group > Ungroup. To regroup items that were previously part of a group, choose Group > Regroup. Rotate: Click this option to rotate your selected object(s). Choose one of the options listed, or choose More Rotation Options to enter a specific rotation value. If you choose More Rotation Options, you'll see a window where you can enter a specific value in the Rotation field, or specify a degree value. Click Close when you're done. With the Crop button selected, click and drag the character within the cropping window. Then click elsewhere on the slide to apply the crop. Or, just type specific dimensions for the height and width in the fields next to the Crop button, and press Enter to apply the new dimensions.